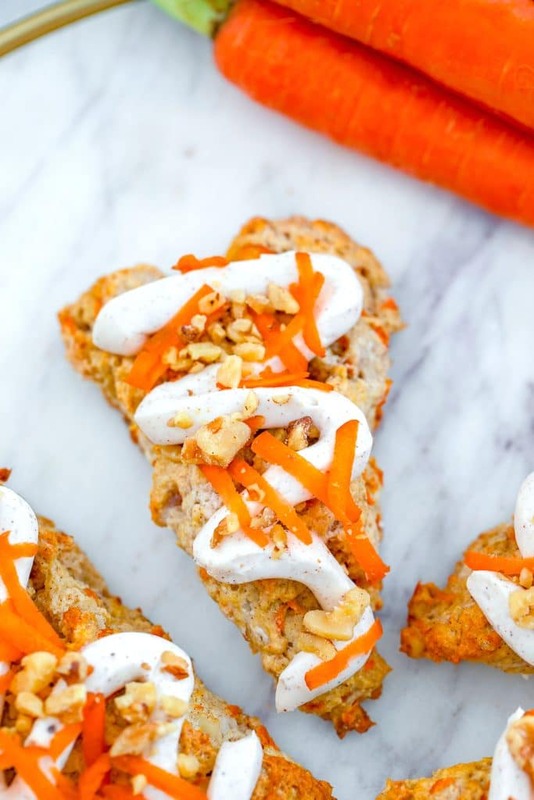 These Chai Carrot Cake Scones with cream cheese frosting combine everything you love about carrot cake into a perfectly spiced treat that’s delicious for dessert or breakfast! Spring is officially here and with it comes all kinds of spring desserts made with lemon, strawberries, blueberries, and other seasonal fruits. OK, and LOTS of Cadbury Eggs (Cream AND Mini), Peeps, and jelly beans. In order to balance out all that sweet fruit and sugary Easter candy, I guess we should talk about seasonal vegetables, too, right? Sigh. But vegetables can be fun, too! Especially if you’re strategically adding them into baked goods instead of salads. And I mean, if we’re going to be baking, scones are “healthier” than most desserts we could make. Though, I have definitely made Cadbury Mini Egg Scones before (and omg you should absolutely make them, too! ), so with those, my “healthy” argument could be moot. But just because they’re not the most sugary, decadent desserts of all time, doesn’t mean scones are boring. If you think scones are boring, you just haven’t had a good one yet! Now that I’ve been making them so often and perfecting my recipes, scones are one of my absolute favorite desserts. Maybe because they’re also totally acceptable for breakfast. I love carrot cake and I also love all things chai spice flavored, so once the idea for chai carrot cake scones popped into my head, these scones were an immediate must-make for me. They take no time at all and if you have a box grater (here’s an affiliate link to the one I own), even the carrots are a breeze to grate! If you wanted to make a big batch of the chai spice or are using a store-bought mixture, you can simply multiply the ratios I recommend and keep the spice mix in a jar. And when you make this recipe, use 1 tablespoon of the spice mixture. 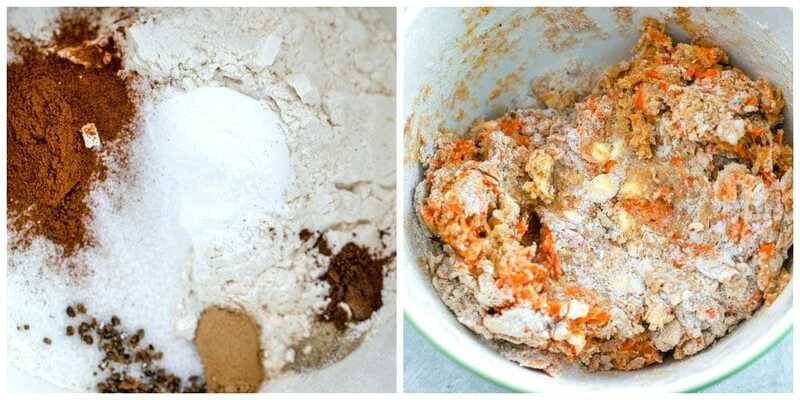 You’ll mix those spices in with all-purpose flour, granulated sugar, and salt. And then cut in a stick of chilled butter cut into cubes and mix in grated carrots, heavy cream, and chopped walnuts if you want. On a lightly floured surface, knead the dough a bit and form into a mound that’s about 3/4″ thick. Cut dough round into 8 wedges, place on a parchment paper-lined baking sheet, and brush lightly with heavy cream. Bake at 400 degrees for 13-16 minutes until scones are turning golden around the edges. Let the scones cool on the pan for a couple minutes before removing to wire racks to cool completely. While the scones are cooling, make the chai cream cheese frosting! The frosting is simply cream cheese, confectioners’ sugar, more of those delicious chai spices, salt, and cream. When scones are completely cooled, drizzle with chai cream cheese frosting. You can also spread it on if you want. 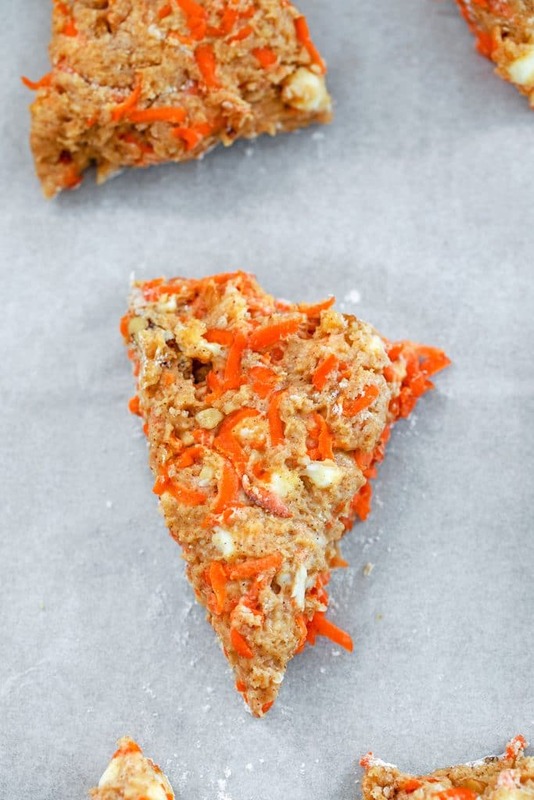 I also added more chopped walnuts and shredded carrots to the top of my chai carrot cake scones. I briefly considered adding raisins into my scones, but I’m fully aware that raisins have been known to cause a lot of controversy, so I decided to stay away from them. I DID add walnuts, but if you prefer a nut-free version, you can certainly leave them out. I honestly don’t know what I loved best about these chai carrot cake scones. The deliciously spicy (in a chai spice way and not a HOT spice way) flavor of the scones, the plethora of carrots, or that cream cheese frosting. I used to hate cream cheese frosting. I wasted a lot of time with that hatred. Especially now that I know the joys of chai cream cheese frosting. Of course, standard carrot cake is delicious, but I now know I would prefer to have it in scone form. You can’t really excuse carrot cake for breakfast, can you?? 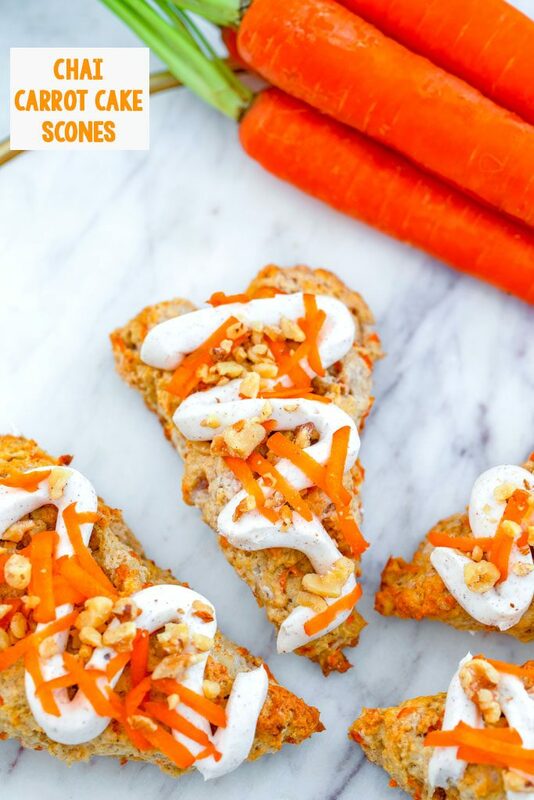 But carrot cake scones? Those are perfectly acceptable with your morning cup of tea or coffee. They make great snacks, too. Basically, you can’t go wrong with a chai carrot cake scone at any time of day. And really, any time of year, considering carrots are readily available year-round. But they’re extra appropriate for springtime and Easter brunch. I might even say they make the perfect side to that Easter ham. Or just your morning coffee while you wait for the Easter bunny. Happy spring y’all!! I hope the weather is starting to warm up where you are. What are your favorite spring ingredients? If you love this recipe, be sure to check out all my scone recipes. You may also want to make these Carrot Cake Oreo Truffles! I also really want to try these Carrot Cake Overnight Oats from Lemons and Zest! 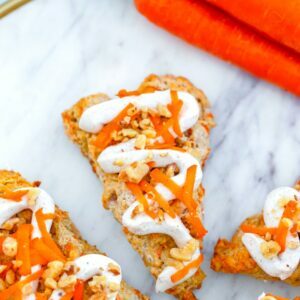 These Chai Carrot Cake Scones with cream cheese frosting combine everything you love about carrot cake into a perfectly spiced treat that's delicious for dessert or breakfast! In a large bowl, whisk together flour, sugar, baking powder, cinnamon, ginger, allspice, cardamom, salt, and pepper. Cut in butter with a pastry blender or fork (or your hands), until pea-size pieces form with some larger chunks remaining. In a small bowl, whisk together cream and eggs. 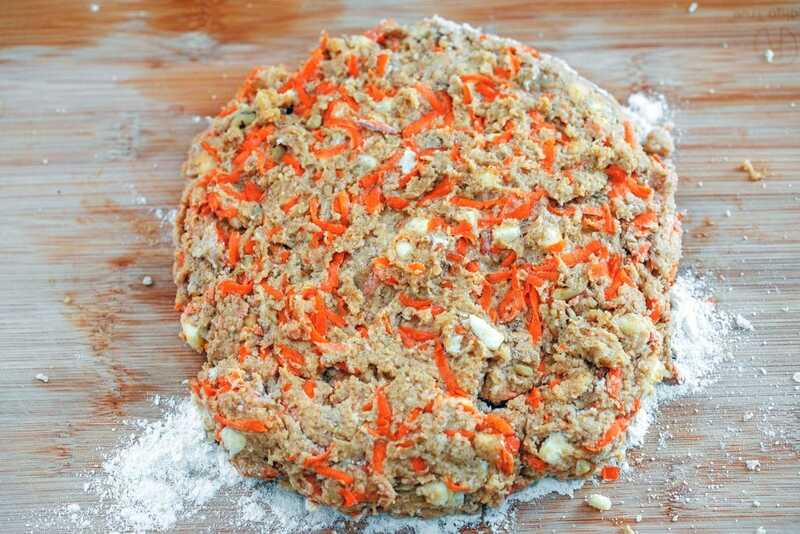 Using a spatula, fold the cream/egg mixture, grated carrots, and chopped walnuts into the dry mixture until just combined. On a lightly floured surface, gently knead the dough a few times. Then using your hands, form a circle about 3/4" thick. Slice dough into 8 triangles and place on prepared baking sheet. Brush scones lightly with heavy cream. Bake for 13-16 minutes, until scones are just turning golden around edges. Let scones cool before drizzling with chai cream cheese frosting and sprinkling with additional grated carrots and chopped walnuts. 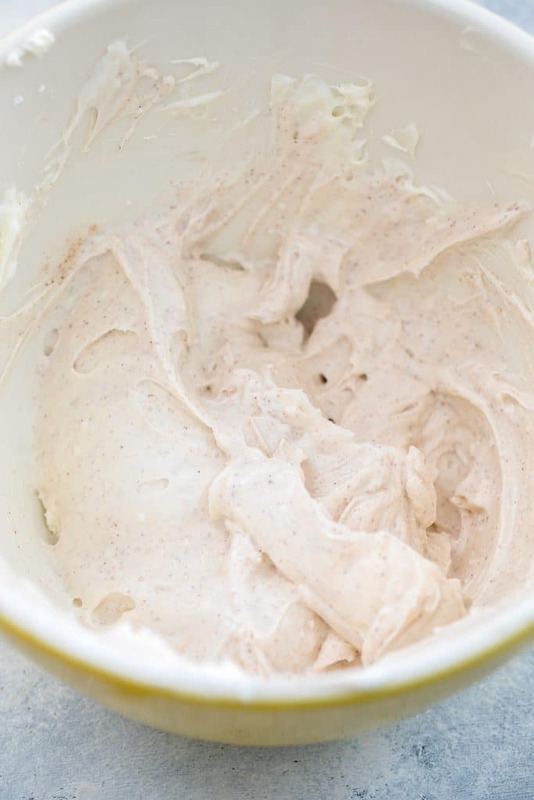 Using a hand mixer or a whisk, beat cream cheese in a medium bowl until smooth. Add confectioners' sugar, cinnamon, ginger, allspice, cardamom, salt, and pepper and beat until combined. Add milk or cream to bowl 1/4 cup at a time, beating well after each addition until frosting is smooth and at desired consistency. 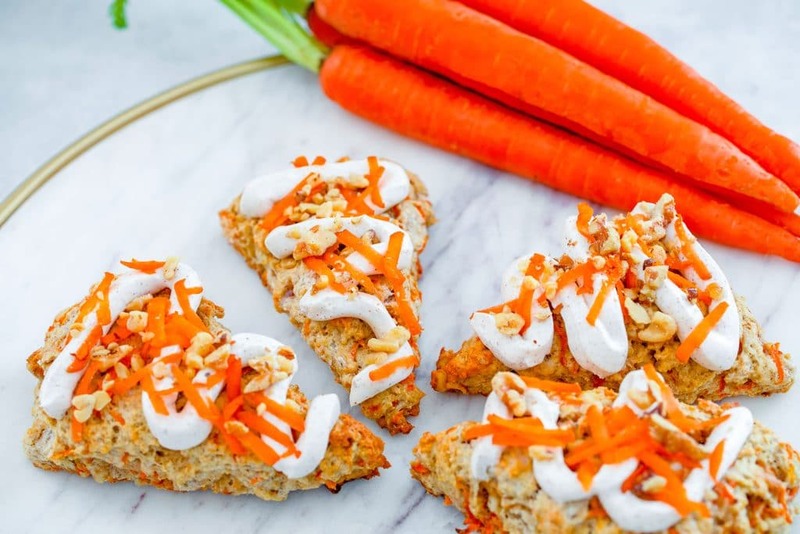 8 Responses to "Chai Carrot Cake Scones"
How good these look! I love carrot cake – so I know I am going to enjoy these scones very much! These look amazing! I’d pass on the Cadbury mini eggs for these ( and that says a lot) ! I absolutely love these scones. They looks so delicious and flavorful. I’m totally into carrots lately so I’ll be making this for sure. These scones look so gorgeous! I would love them anytime, so rushing to the kitchen after work this evening to make them. carrot is one of my favorite vegetable also…and this cake looks gorgeous with most beautiful pictures as well….Thanks for sharing….! How beautiful and bright are these!? So perfect for spring. I love the idea of combing chai and carrot cake!! This is a fun recipe to make this Easter. And adding chai makes this scone extra special.